Ke-Lan-Tan House i Penang, Malaysia: Bestill nå! Ke-Lan-Tan House is a 2-storey tall building with 10 rooms. 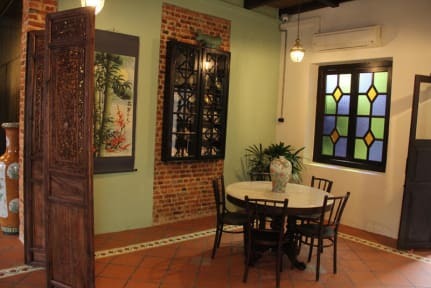 The building is located at Kelantan Road, centrally located to shopping, Penang Street Art, Chew Thean Yeang Aquarium & Pet Shop, Penang Road Famous Teochew Chendul and countless of recreational activities. You can reach us either by walking from KOMTAR, or take any buses that stopped at Transfer Road. 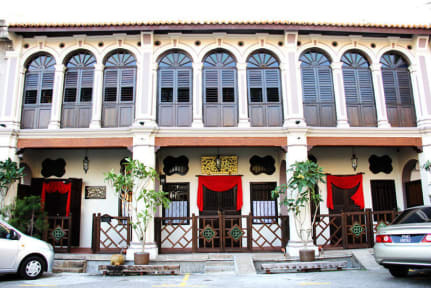 You can also enjoy famous delicious Penang food such as Laksa, Char Keow Teow, Hokkien Mee located nearby. Three of the room is located at the ground floor and the rest of them located at the first floor. There are two rooms which we specially design for family with children. The room consists of a queen size bed and two single beds for their kids. The center of attraction in Ke-Lan-Tan House would be the master bedroom. The bed is structured using few hundread years of Chinese wood sculpture and also will bring harmony and peace to the person who sleep on it. Besides that, our rooms are not numbered but named after the famous Penang streets: Penang Street, Beach Street, Carnarvon Street, Light Street, Chulia Street, Pitt Street, Muntri Street, Campbell Street, Armenian Street and Kimberly Street. The room can be divided into 4 categories: Superior suite, leisure suite, family suite and love suite. Each room is facilitated with air-conditioner, TV set, wireless internet and own toilet.